Want to help get more kids on bikes? This holiday season we have partnered with Shaw Communications to provide bicycles to children in Vancouver who might not otherwise have access to one. 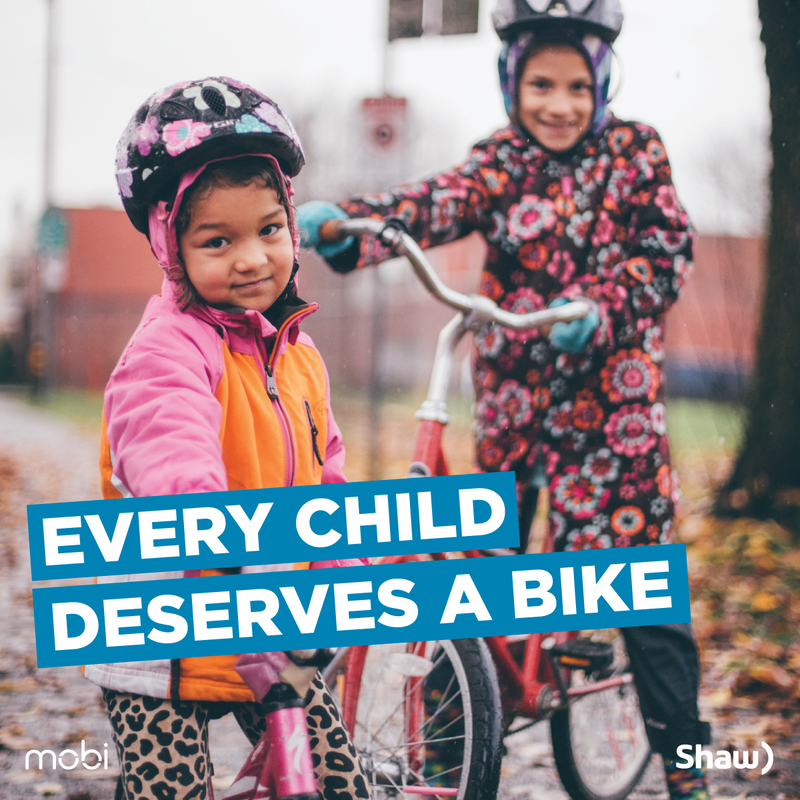 For every 365-Day Mobi by Shaw Go gift card sold, Shaw will donate a bike to a charity for a child to use. Since launching Mobi by Shaw Go, we have focused on helping adults overcome the barriers to cycling and promoting the many benefits of riding a bike. But perhaps even more important than getting adults to adopt the bicycle as a transportation option, is inspiring the next generation to ride. By providing kids with bicycles, we open them to a fresh and unseen new world. It gives them a sense of ownership, a sense of responsibility and promotes a healthy lifestyle. The benefits of active transportation for children are tremendous: improved fitness, increased awareness of their surroundings, and more confidence. It’s time to get our kids moving. As these kids grow up, having been exposed to bicycles, they will learn to see the world through a whole new lens — one where alternative transportation isn’t just an afterthought and all people, no matter their mode of choice, feel safe and comfortable getting to their destination. Purchase either a 365 Day Standard gift card or 365 Day Plus gift card between November 22and December 20 and Mobi by Shaw Go will give up to 60 bikes to kids at Immigrant Services Society (ISS) of BC, Ray-Cam Cooperative Center, and Britannia Community Services Centre. Once you purchase a pass, the Mobi by Shaw Go elves will wrap up the bike to be delivered to the charities on December 21. Follow us on Instagram as the Mobi by Shaw Go elves inspire the next generation to ride. Since the launch of the Vancouver Community Pass we have been working with ISS of BC, Ray-Cam Cooperative Center, and Britannia Community Services Centre to help make bike share more accessible and affordable. These three charities have done an incredible job connecting us to adults in need of transportation alternatives. We look forward to working with them to now make bikes more accessible to kids! Stay tuned for the next post where we will highlight each of these organizations in more detail.